Well a glorious season of football has come to a close and we now have 7 months to bask in the glory of being champions… and make many by the truckload of money selling ridiculous crap with a Rider logo and Grey Cup on it (who am I kidding, I’ll be buying it too). But just because the offseason is upon us doesn’t mean things will be shutting down on the blog. As always I will keep things going year round to ensure you are up to date with the latest CFL news (or at least news that is still somewhat topical by the time I get around to writing about it) and the latest smart assed and irreverent commentary that pops into my mind. This offseason will be even more eventful than normal with the Ottawa Expansion Draft coming up in a few weeks. I will have full coverage including team by team previews of who will be protected and who will be drafted starting on Monday. In two weeks’ time I will also be handing out the coveted 7th Annual Rider Prophet Awards. You will already have noticed that voting has opened for the Fans Choice Douchebag of the Year so be sure to let your voice be heard. I will also keep you up to date on Free Agent signings and coaching changes. For example: Ed Hervey just hired Chris Jones as the new Head Coach of the Esks. Hervey says Jones is like him… which I assume means Jones will soon be publicly humiliating Simeon Rottier, get fined for tampering and say he’ll remove play calling from the OC only to not actually do so. Good times in Edmonton. Also, rumors have Winnipeg hiring Mike O’Shea as the new Head coach and bringing in Khari Jones as their OC. Lots more to come to fill up your dreary offseason days courtesy of the Prophet. Besides we could all use a few months to get over our Grey Cup sized hangovers. For franchise whose history is littered with heartbreak it was nice to finally get our storybook ending. No doubt, no stress, no controversy… just a team going out in front of a once in lifetime Rider home crowd and doing what they were expected to, win. It’s moments like this that remind you of why you have held faithful to this team through all the aforementioned heartbreak. The Mosaic atmosphere was unreal. It was already kinda loud during warm-ups when only a handful of fans were in their seat. And it got taken to a whole new level when the Riders hit the field… and it didn’t stop until sometime this morning. My voice is long gone, my head is pounding, my liver hates me, I have barely slept and I am still happy beyond belief. You need your best players to have their best games when it matters most and that was certainly the case on Sunday. Sheets was unreal, Simon proved why we brought him in, Dressler was Dressler, our lines were dominant and above all Darian Durant played like a champion and finally earned the ring he is so deserving of. He simply was not going to be denied. John Chick was a beast. Defense as a whole was solid. Simply put our best players played their best football and that alone would have been enough to secure our 4th cup… the deafening crowd was simply a huge bonus. 2) Dressler. Just further cements his continuing legacy as one of the best receivers in franchise history. 3) Bagg. Passed on a chance to play for the ’07 to go back to school and has fought like warrior even since to overcome countless injuries. Note the midget barely visible behind Durant is Dressler… someone should have gotten him a stool or something. - Really surprised that Austin did not even try the LeFevour or Masoli packages. Also surprised at why they even bothered dressing Gable for how little he was used. For as good of a coach as Austin is, I thought those were glaring errors. - Burris standing idle already chastising his teammates while everyone else dove for the live ball on that botched snap was classic Henry. - That fumble straight to Sheets in stride is the definition of needing to be good to be lucky and lucky to be good. Sunday, we will be a part of history. In the century-plus that we have been a franchise, there has never been a game like this (and there may not be again for a long long time). 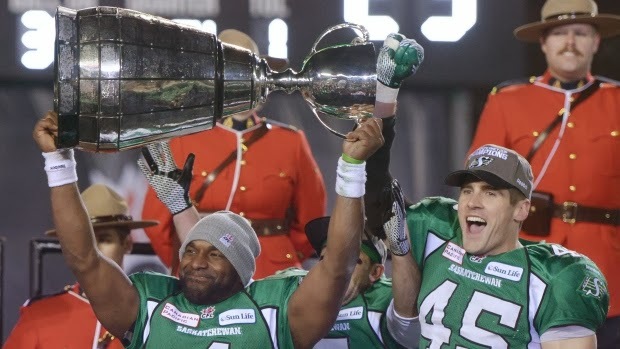 Any Grey Cup with the Riders in it is automatically big. We have so few championships we go nuts when such a rarity occurs. However, this one will be taken to a whole new level as the championship goes down on our own home turf. The atmosphere alone will be unprecedented. We did defeat these Ti-Cats in both meetings this season but you can throw that tape out the window as the Ti-Cats are a vastly improved team since then. Back then they were young, missing key vets and had not yet caught on to Austin’s new systems. They were so bad that we beat them with a broken footed Durant and slapped them around with Willy. Let’s start with the offense where Darian Durant is so focused on winning the cup that’s he’s almost robotic. I have never seen him even close to this dialed in and that should worry the Ti-Cats. He has taken his game to an elite level in these playoffs and you can bet will do it again on Sunday. Unlike like last week when we got to victimize a weak interior DL, that is one of the strengths of the Ti-cat D. Bulke and Davis are very solid. That said their ends are average at best and our OL is dominant. I think we will have the most success in TE sets with Sheets running outside. I think we should still attack the middle but expect the most damage to be done on the perimeter. A heavy dose of Sheets and Sanders will be needed again. With the run established and Hamilton having a not so intimidating pass rush robo-Durant will have time to pick apart a relatively inexperienced secondary. I would attack the safety in particular as he is a rookie and while I like his potential he is still prone to mistakes. The Ti-cat D is much improved but if we continue to spread the ball around and if Durant has time then they are in trouble. Put it this way, Hamilton’s D is nowhere near as good as Calgary. Can’t get cocky but it’s a match-up that favours us and we should be able to take advantage. For me the real interesting thing to watch will be our Defense vs. Kent Austin’s offense. It goes without saying that any chance Hamilton has in this game rests on which Henry Burris shows up. At his best Hank looks like the future hall of famer. At his worst he rivals Michael Bishop for comedic ineptitude onfield. The key will be getting to him early. Once Burris gets rattled, with 45000 fans on his case he will begin a downward spiral that makes him more desperate to made plays himself but more careless in the process. Getting him rattled starts up front (or maybe by putting some itch powder in his gameday sports bra) our D-line is downright scary and Hamilton gave up more sacks that anyone (even Edmonton’s sorry excuse for a line). So if it comes down to a pure pass rush situation for our guys Burris is in trouble. But you can bet Austin will try and counter that mismatch in a few ways. First is with CJ Gable. He’s a talented runner and receiver and tough to bring down. Second will be with Burris using his legs. DEs will need to be disciplined and contain those edges. Third Austin will deploy either LeFevour or Masoli packages to give new looks and set up new running lanes. So our front 7 will have their hands full but are up the challenge. We need to choke out the run game (not literally of course… unless the ref isn’t looking) and force Burris beat us through the air. There’s danger in that as Burris led the league in pass yards and was 2nd in TDs but there is also opportunity as no one threw more picks that Burris (shocking I know). With the strength of our pass rush and the talent of our DBs a heavy passing attack favours us. The more the cats run, the more they increase their odds of winning. Quick note on kicking (because what are the odds a Ham/Ssk Grey Cup comes down to that). Milo is hitting at 88% while Congi was 75% on the season and benched briefly. Edge to us there… edge gets even bigger if crews can covertly grind off a few millimetres off the goal posts to make them smaller. By no means do I consider it a guarantee that we will win but realistically I fully expect us to. We have beaten better teams to get here. We are the better team on paper. We have an unprecedented crowd on our side. Durant is beyond focused. Burris has never beat us in the playoffs. Take your pick as all are valid reasons for picking us to win. So lt’s show the country a Grey Cup like no other. If you can hear or talk on Monday morning we have all failed. Bring Em Out!! Bring Em Out!! See you at Vic and Albert.